The sun will come out . . . . Actually sunshine is something we have an abundance of here. I dislike posting that I have nothing to post but I really have nothing to post. Friday we took a lovely drive to LLano, where we also picked up home grown watermelon and Israeli melon. We'll be having the latter tonight and I can't wait. We came back via Hwy 71 and saw some of the damage from the Spicewood wildfire. The scope of that one was so great that I cannot even imagine the shock that seeing Bastrop would cause. My heart goes out to anyone who had to experience any of the fires we've had in the past month. The weekend was the weekend and yesterday was spent running errands. Note to self: no more grocery shopping on Monday morning lest ye be run over by employees restocking shelves. Sheesh. Yesterday was a wash and today is a heavy homework today. (Look, I'm posting before 8:00 a.m.!) I do have some new foodie blog links to share. So maybe I'll post tomorrow. Yesterday was filled with mundane stuff, notably a visit to my dentist. I love the man and yet hate him at the same time. Maybe it's the idea of what he does that I hate. Later a trip to the chiropractor to undo the tenseness brought on by the visit to the dentist. My chiropractor and I have a lot of things in common so it's always an interesting visit, plus he does a special treatment for fibromyalgia that actually leaves me feeling energized. It's purely a love relationship. This was followed by a trip to the grocery store to pick up lunch. I hate the grocery store, but lunch with T-man was great. And yes, that is my BIG love relationship. The evening ended with seminars (yes, I was there on the right night!). They were very interesting seminars this week, but sitting with the laptop in my lap, earbuds in my ears, typing quick sentences for two hours can just be horrendous. See? Love/hate relationships. I can easily apply this to beadwork. For instance, I love the look and feel of right angle weave, but it is so very tedious. Love it, hate it. Knitting? I love the tranquility of it, but it's just too hot to knit. Okay, I realize that one is a stretch. So what about you? What's your artistic/creative love/hate relationship? It ain't no big thing. It's deceptive in both its simplicity and its complexity. I do wish it still fit. I hate the thought of remaking it. 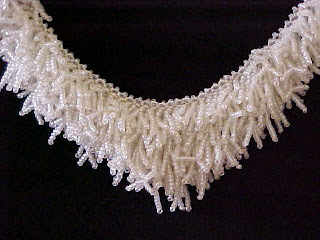 It was one of the very first pieces I made back when I first started selling beads in 1997. Ariel was still napping most of the day and I would stitch while she slept. What is your favorite simply complex piece? I have several pictures in my head of pieces created by beady friends, but I would like to know your favorite today. Anyone?? There is still beadiness running around in my noggin and I love when someone prods it. What is there to say when one of your idols promotes your work? 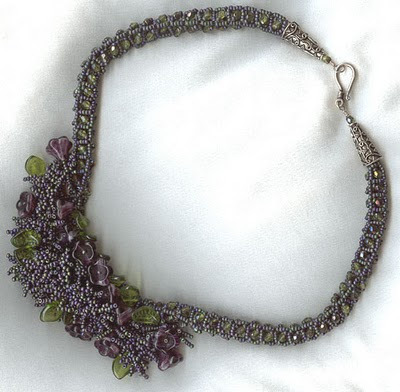 I have loved Sharri Moroshok's work since shortly after I started selling beads 14 years ago (when we were both around 10). Now I love size 15o seed beads but Sharri is insane! 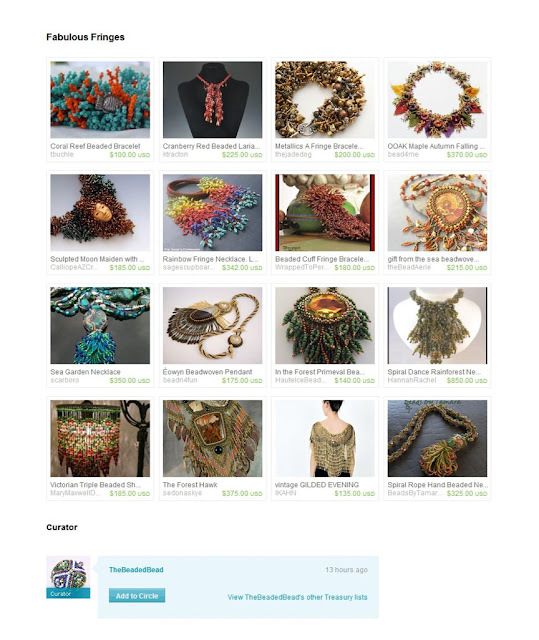 She included my Coral Reef Bracelet in a treasury over the weekend. Here's a link to her Etsy store. Thank you, Sharri! It's a gorgeous treasury and I'm proud to be part of it. Christine at Live Passionately has some words of wisdom regarding "victimitis". Words can be so powerful. Sometimes we forget. Finally, for your noshing pleasure, I present Homemade Chocolate Pudding from Life Blessons. Oh my goodness. How yummy does this sound? T-man is already asking for it (the pudding, you understand). And since it is Monday, I must finish this week's homework. I am off! Have a great day! Duh . . . . Yesterday I gave you Fashion Trendsetter's fall color forecast. Today I offer Pantone's fall color forecast. I must admit to liking the Pantone colors more. I really wish I had more hours in the day. I know, I know - what fun is a blog that is never updated? Shame on me. I would love to tell you that the reason I've been away is that I've just been inundated with ideas. Alas, that is not so. I've been inundated with school. This term is writing heavy. And yes, my life is a roller coaster. I have some ideas for some almost daily fun for you. I'll start scouting the give aways and contests again. There will be some yummy recipes and, as always, beautiful pages to inspire you. Let's start with this one: the color forecast for fall. To make up for my lack of diligence, I have updated the web sites and blog lists to read. I've also added foodie blogs. I'm doing away with my other blog. That means that now you'll get school stuff and food stuff along with art stuff. Hey, what better way to create than with something for noshing on the work table? Just don't get the art sticky. Let's start over with a question for the day: What have you been doing while I was away?